MicroSummary: Who’s heard of the eccentric CEO of Tesla Motors, Elon Musk? He is one of the most unpredictable and ambitious entrepreneurs in Silicon Valley, and the press always labels him as the next Steve Jobs. 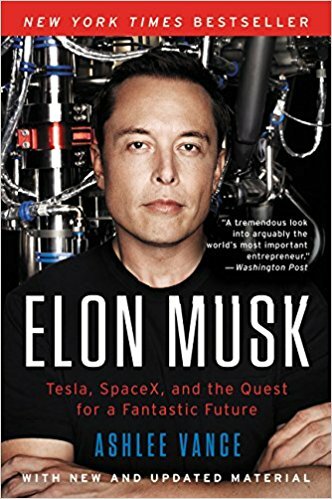 South African boy Musk has always been passionate about technology, space, and renewable energy and moved to the United States as a teenager. His goal was to unite his passions and to start businesses and, without worrying about money, he became one of the 100 richest men in the world. Explore the history of this great visionary and discover how he has dedicated his energies to reinvent the future beyond science fiction films in this unique 12′ microbook. Elon Reeve Musk was born in Pretoria, South Africa on June 28, 1971. His father, Errol Musk was an engineer and entrepreneur, and his mother Maye was a well-known model and nutritionist. Elon had two younger brothers, Kimbal and Tosca. Endowed with a photographic memory and an appetite for reading, Elon did well in high school. His parents divorced during his teen years, and at age 17 Musk left South Africa to go to Canada. His mother Maye was a Canadian citizen, and so Elon got the Canadian passport. Elon eventually enrolled at Queen’s University in Kingston, Ontario. He chose Queen’s because he felt the college had more beautiful women than other universities. When his siblings went to Canada, Elon and Kimbal had a habit of calling some interesting people to arrange a conversation and lunch. They were able to meet some influential people including the marketing director of the Blue Jays baseball team, a business writer for the Globe newspaper and a Bank of Nova Scotia executive. Elon studied Administration and began selling parts of computers and PCs mounted in his dormitory. He was starting to excel academically, and after two years at Queen’s, he applied for a transfer to the University of Pennsylvania with a scholarship. He decided to study economics at Wharton School and earned a bachelor’s degree in physics. He and his roommate Adeo Ressi rented a house near the campus. At weekends they would turn the house into a nightclub and charge five dollars for admission. It was not uncommon for 500 students to show up on a Friday or Saturday night – allowing Elon and Adeo to pay the entire month’s rent in just one night. While at the University of Pennsylvania, Musk wrote a paper detailing “the energy station of the future,” which consisted of massive solar arrays in space, transferring energy to the earth via microwave. He also wrote a second paper that talked about putting all the information in the world into a single database. A third was about the commercial potential of ultracapacitors as storage devices. Musk decided to pursue projects in three areas – the internet, renewable energy, and space. He was not too worried about becoming rich or making money but making a difference in the world. In the summer of 1994, Elon Musk and his brother Kimbal toured the United States driving a 1970 BMW 320i. They started in San Francisco and ended up in Pennsylvania. Elon did internships at two Silicon Valley companies, the Pinnacle Research Institute, which explored ways to use ultracapacitors in electric and hybrid vehicles and Rocket Science Games, which was starting to move from cartridge kits to the then-newest CDs. Musk liked Silicon Valley, and as soon as he graduated, he went back there and pursued his doctorate in Materials Science and Physics at Stanford. He left Stanford after two years and persuaded his brother Kimbal to move to Silicon Valley. The brothers decided to launch the Global Link Information Network, which later came to be called Zip2. The company wanted to be a directory of restaurants, clothing stores, hairdressers and other businesses. The purpose was to list these services in a searchable directory linked to a map. Zip2 rented a small office in Palo Alto and began hiring employees. Elon took care of the site’s programming, while Kimbal started selling the product door-to-door. Their father gave $ 28,000 to fund the deal, but the money was so tight that Elon and Kimball slept in the office for the first three months. They showered at a local gym. Selling catalogs in an online directory was very difficult at the end of 95. The sales team was struggling, but no one was buying. Despite this, the brothers remained confident. In late 1996, investment firm Mohr Davidow Ventures learned that they were trying to create the virtual yellow pages and after meeting Elon and his brother a few times, they agreed to invest $ 3 million in Zip2. With this investment, Zip2 decided to create software that would be sold to newspapers, allowing them to build their local online directories for real estate, car dealerships and other classified ads. The capital injection also allowed Zip2 to hire more talented people. They hired a new CEO and software engineers, but Elon, chief technology officer, was bothered because he wanted to be the CEO. The change in the direction of Zip2 worked very well. The New York Times, Hearst Corporation and several other companies not only signed the service but also invested with an additional $ 50 million in the deal. On April 98, Zip2 announced that it would merge with CitySearch, its main competitor, in a deal worth about $ 300 million. At first, Elon Musk was in favor of the deal, but then changed his mind and did everything to get the deal dissolved. The board of directors canceled the merger, leaving Zip2 in a precarious position as the deal was losing money. Compac then became interested in the business and offered $ 307 million for Zip2. The board approved the sale and, with that, Elon Musk received $ 22 million for his shares in the company and his brother Kimball got $ 15 million. With the money from the sale, Elon decided it was time to launch a new service, an online bank. He registered the domain and opened the company X.com in March 1999 and soon began recruiting software engineers and developing his business plan. He set up an initial team that included two hardworking Canadians, Harris Fricker and Christopher Payne and Ed Ho, a former Zip2 executive. Within five months, the co-founders grew tired of the conflicts with Elon Musk and left X.com. In November 1999, X.com got its license to start banking. 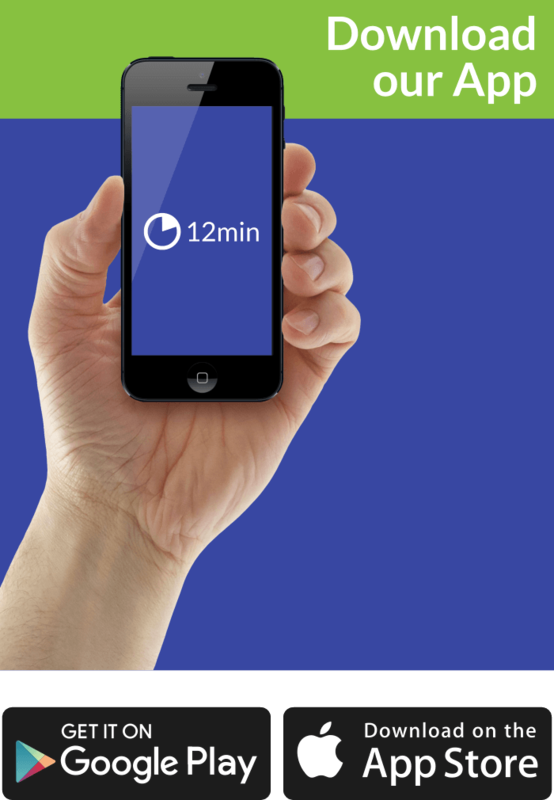 It was launched as one of the first online banks in the world in the same year and got 200,000 customers in the first two months of operation. The initial success of the company did not go unnoticed, and in months, it already had a competitor called Confinity. Confinity was created for Palm Pilot owners could send money using the infrared technology available on their handsets. When they realized that their market was small, they began to focus on the internet and how to make payments by email. The new service became known as PayPal. In March of 2000, X.com and Confinity decided to join their forces and merged, maintaining the name X.com. After a few weeks, X.com raised $ 100 million in investments from Deutsche Bank and Goldman Sachs. The company had more than one million customers at the time. Elon Musk continued to invest in X.com and increased its position as the company’s largest shareholder. X.com was renamed PayPal in June 2001 and was already generating $ 240 million a year in revenue. That attracted the attention of eBay, which offered $ 1.5 billion by PayPal in July 2002. They accepted the offer, and Elon Musk earned about $ 250 million from the sale of his second company. Elon then decided to move with his wife to Los Angeles and began getting involved in space projects. He joined the board of directors of the Mars Society, a non-profit organization that united scientists and engineers who wanted to think about a possible colonization of the planet Mars. The company planned to send a small robotic greenhouse to Mars to use the Martian soil and grow plants. Musk decided he would use his money to start a company to build space rockets for those projects. He found he could use a medium-sized rocket to launch small satellites and research loads at a cheaper cost than those charged in the aerospace industry. After a few months of research, Musk decided to move away from theory to practice. In June 2002, he incorporated Space Exploration Technologies. The startup bought a 7,000-square-foot building in Los Angeles and started working on building commercial rockets. While other companies charged $ 30 million to launch a 250-kg cargo into space, Elon Musk promised that Space X would carry a 650 kg load into space for $ 6.9 million. Musk has injected $ 100 million of his own money to finance SpaceX. He recruited direct trainees from top universities as well as engineers who were motivated to work for a rocket company. SpaceX bought a test field in Texas, where engineers would test rocket engines. At first, the engines only ran for 2 or 3 seconds before exploding. However, after months of trial and error, SpaceX learned how to build reliable engines. The first official launch took place in March 2006 and SpaceX’s first rocket, Falcon 1, took off and exploded twenty seconds later. The remnants of the explosion spread through SpaceX’s buildings. A year later the company launched its second rocket. This time, the first stage of Falcon 1 worked well, but five minutes later, the rocket exploded. It was clear that getting to space would be a much bigger and more expensive challenge than Elon Musk imagined, but it was only a matter of time. In the fall of 2003, J.B. Straubel met with Elon Musk at SpaceX to convince him to invest in a project to build an electric plane. Musk did not like the idea but was very interested when Straubel described a part of the project that would serve to build an electric car using lithium batteries. Musk agreed to invest $ 10,000 on the spot. Shortly after that, Musk was approached by the founders of a new company called Tesla Motors. They were looking for an investor to put in $ 7 million so they could create and sell a sports car powered by an electric motor. Elon Musk agreed to invest $ 6.5 million in Tesla Motors, and that made him the largest shareholder and president. Musk put Tesla founders Martin Eberhard and Marc Tarpenning in contact with J.B. Straubel, who was working to develop batteries for electric sports cars. The Tesla team opened their offices in a 1,000-square-foot warehouse in San Carlos and began developing the technology. Tesla’s original plan was simple – picking up a Lotus Elite and reforming it with an electric propulsion developed by a company called AC Propulsion. They assumed that Tesla would outsource the transmission and other parts, but the reality was much more challenging. For example, no one had ever attempted to combine many lithium batteries in parallel. Engineers had to figure out how to attach the cells as not to dissipate heat and prevent a fire from spreading through the vehicle in the event of an accident. Later, they decided that the new Tesla car, called Roadster, also needed to please the customers and be elegant. The company hired designers who developed a new design made of carbon fibers. In January 2006, Tesla captured another round of investments, raising $ 40 million. Musk invested another $ 12 million in the deal. When the new Roadster was announced in July 2006, the price for the car was $90,000. The Roadster rode about 400 km per battery charge. But when financial analysts studied Tesla’s business plan, they realized it would cost $ 170,000 to $ 200,000 to build every car that would then sell for about $ 90,000. Despite Tesla’s progress, in 2008 the company spent $ 140 million to develop the Roadster – $ 25 million more than the estimated value in the 2004 business plan. To make matters worse, financial markets were going through a massive crisis. Also, SpaceX failed in its second launch attempt. Musk’s $ 200 million fortune was fading. SpaceX was struggling to have enough money to pay its employees. Tesla was also facing financial problems, and several negative articles appeared in the media about Elon Musk’s business management capabilities. In December 2008, Musk developed simultaneous campaigns to raise investments for Tesla and SpaceX. SpaceX won NASA contracts after its fourth successful launch. On December 23, NASA announced that it would provide $ 1.2 billion for SpaceX in a twelve-fight service contract for NASA’s Space Station. Meanwhile, Tesla needed more capital or would have to declare bankruptcy. Musk had a plan to inject another $ 40 million into Tesla. After unsuccessfully trying to get the money from investors, he took out a loan with SpaceX and financed the $ 40 million needed. Currently, the SpaceX Falcon 9 rocket is considered very reliable by the space industry. SpaceX launches on average one rocket per month, putting satellites into orbit for various countries and companies. The fact that SpaceX manufactures all of its machines is a major competitive advantage and has made the United States a major player in the commercial launch market. All of its American SpaceX competitors, such as Boeing, Lockheed Martin, Orbital Sciences, rely on Russian suppliers for their launch vehicles, while SpaceX manufactures everything in-house. This independence translates into cost savings for customers. 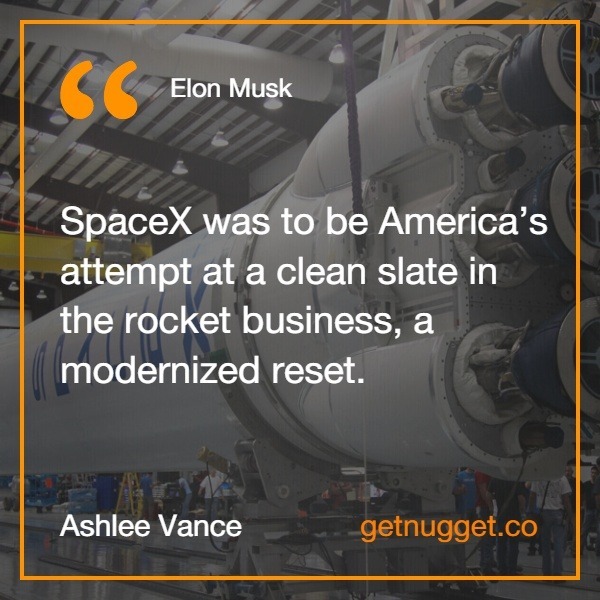 At present, a Falcon 9 flight costs $ 60 million, and the company is working to reduce that cost to $ 20 million using economies of scale. In the long run, Elon Musk believes the cost per flight may be less than $ 12 million. In comparison, the United Launch Alliance charges the US government about $ 380 million per flight. The latest generation of SpaceX rockets is Falcon 9, but the company is already developing the Falcon Heavy, a giant rocket joining three Falcon 9 rockets to create a launch vehicle that will withstand twice the load of its largest competitor, at a third of the cost. SpaceX is also developing a Texas spaceport and docking capsules on the International Space Station. And the most impressive: SpaceX managed to achieve all this being a private company, without opening its capital. Musk then decided it was time for Tesla to build a new electric car. He joined Franz von Holzhausen, an experienced car design. He and Musk then developed the Model S design. After nearly leaving the market in late 2008, Tesla impressed the automotive market by launching its Model S sedan in the middle of 2012. This luxurious electric vehicle features a battery, which is the base of the car, and an electric motor the size of a watermelon that located between the rear tires. It can do more than 480 km on a single charge and accelerates from 0 to 100km per hour in 4.2 seconds. For engineers, the Tesla Model S has impressive statistics. Traditional cars can only convert 10 to 20% of gasoline’s energy into propulsion energy, with the rest lost as heat, wind resistance, brakes and other mechanical functions. The Model S has only a dozen moving parts and is about 60% efficient. In practical terms, this means that the Model S does the equivalent of 160 km per gallon of gasoline. Model S not only has incredible styling, but Tesla has also reinvented the experience of buying a car. You can purchase a Model S from the company stores or Tesla’s website. There are no pushy sellers because they do not get commissions. You can choose to pick up your car from the factory in Silicon Valley, or Tesla will deliver the car wherever you want. After you buy it, you will not ever need to change the oil. If there is a problem, Tesla will come to you and lend you another car while they fix yours. And while you charge it, Tesla engineers can install software updates over the internet. After nearly breaking in late 2008, Tesla began selling its original Roadster model in early 2009. As the company began to gain traction, Musk declared a price increase for the Roadster from $ 92,000 to $ 109,000. Customers remained loyal as they bought the idea of trying to change the world, but Tesla had to recall its two vehicles, generating negative publicity. From 2008 to 2012, Tesla sold about 2,500 Roadster cars. When General Motors and Toyota announced they were closing their factory in Freemont, California in 2009, Musk took action. He bought the plant for $ 42 million, Toyota spent almost $ 1 billion to build it. Also, Toyota announced that it would invest $ 50 million in Tesla for 2.5% of the company. Musk decided to open Tesla’s capital in an IPO in the summer of 2010. In doing so, he could raise the $ 200 million that the company needed at the time. The IPO occurred in June 2010 and raised $ 226 million for Tesla, despite the fact that the business had reported losses of $ 55.7 million in 2009. When Tesla announced the Model S in 2009, it promised to start delivering the cars in 2010. When the Model S began production in 2012, the automotive world was still impressed despite the delays. Also, Musk announced that the company had started to build the first part of a network of charging stations, which eventually would spread throughout the United States. Car owners could charge their batteries for free, and the car’s onboard computer could guide them to one of the nearest stations. But in 2012 Tesla was again in unfavorable financial position. A large number of people reserved the Model S for $ 5,000, but few people bought the car. Musk worried and had all company employees call people on the waiting list. He also negotiated with Larry Page from Google to buy Tesla for $ 1 billion and a $ 5 billion investment promise. Musk did not have to close the deal with Google. In a few weeks, money started coming in, and Tesla sold 4900 units of Model S.
Tesla impressed the market in May 2013 with $ 562 million in sales, which caused its stock to jump from $ 30 to $ 130 in July. Tesla announced in 2013 and 2014 that it now had the technology to change Model S’s batteries in 90 seconds for the price of a gas tank; also announced a new high-performance version of Model S and a third-generation car called Model X. It was clear that Tesla would continue to stand out and change the world’s automotive industry. In 2006, Elon Musk’s cousins decided to try a new challenge. They started a company called SolarCity, which installed solar panels in homes. Elon became the director of the company and its largest shareholder. In 2012, SolarCity became the largest solar panel installer in the US, made its IPO in 2012 and by 2014 the business was valued at $ 7 billion. Soon after, SolarCity announced that it would start selling energy storage systems in partnership with Tesla Motors. The company also signaled its interest in making its solar panels. When Tesla announced that it would build its factory to make lithium batteries for its cars, it generated a great war between the states that wanted the factory in its territories. Nevada won by offering Tesla tax incentives worth $ 1.4 billion. The Tesla factory, called the Gigafactory, will be the world’s largest lithium-ion battery manufacturing plant and will also allow the company to lower its battery costs for its new cars. Faced with this cost savings, Tesla brought to market an SUV called Model X and the Model 3, due to come out in 2017. The Tesla Model 3 is priced at $ 35,000. Meanwhile, SpaceX is gearing up to start taking astronauts to the International Space Station. The company is also starting to build and sell satellites. Elon Musk’s long-range plan is still to make SpaceX grow to the point of making it viable to build a human colony on Mars. Want to get the full book in Kindle, hardcover or paperback version? Get it from here! Elon Musk was worth about $ 10 billion in 2015, but what sets him apart from most billionaires is his willingness to lose everything. For example, he does not want just one Gigafactory; he wants countless competing with each other. He is willing to use his wealth to get others involved, even if it means increasing competition against himself. 12min tip: Since we are talking about great entrepreneurs, what about reading Steve Jobs’ autobiography? We loved it!